Here is the complete guide to writing haiku—from inspiration and word-sketching in the field to the poem’s final draft on the page. A major American haiku poet, Lee Gurga, shows what it takes to write a successful English-language haiku—a genre only recently introduced into our literature and one that is finding a rebirth in English. Like a laptop computer, a haiku is a miracle of compression. 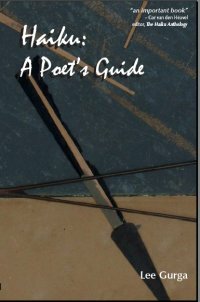 Gurga reveals the layers of meaning and emotion, and the philosophical and spiritual implications, that lie in each of these short, concise, suggestive, yet simple poems. Going beyond the usual dos and don’ts, Gurga gives us the whys and hows, the whats, wheres, and whens of haiku creation. He details the differences and similarities between this new incarnation and the traditional Japanese haiku. Using examples of the best haiku being written today, he breaks each poem down into its components—both material and spiritual—to show all the pieces that make the poem work, and then shows how they were put together. Wow! Breath of the Buddha! Lee Gurga is an award-winning haiku poet and editor of Modern Haiku. He is poetry editor of Illinois Times (Springfield) and haiku columnist for Solares Hill (Key West, Florida). He divides his time between Lincoln, Illinois, and Key West.